I was talking with a friend of mine yesterday who is an award-winning poet with several collections published by a prestigious academic press. She talks frequently about being depressed and frustrated as a writer, so I finally asked her about the source of the frustration. Her reply was very intriguing. She said her frustration comes from knowing that her words never get her quite to the place deep inside herself that she wants to find, explore, and reveal. She gets close, but never has a sense of fulfillment. The depression comes from the fear that she never will get there. Perhaps her work is actually so good (and it is) because she is on a quest for something that will continue to elude her for the rest of her life, and she is not a young woman. I am not suggesting that she is fighting the proverbial windmills, but I do think she is on a magnificent journey without necessarily knowing the intended destination. Maybe that is, and always has been, the case with all good artists — the final destination is determined not by the traveler, but by the observers of the voyage after it is over. I am getting old and crusty. I am coming to terms with the transformation, recognizing the clear signs that it is getting more difficult for me to cope with certain circumstances. No, I am not referring to aches and pains, fatigue, stiffness, or any other physical ailments. I have them, but they are few and for the most part do not pose any real threats nor create significant obstacles. My job is complex at times and generates the typical amount of stress that most professionals have to manage, but I certainly have no complaints there either. From time to time, worrying about my children and their future keeps me awake at night, but considering all the grief some parents face with their kids, I consider myself rather fortunate. I have the best wife a man could hope for — in that respect, I am the luckiest guy I’ve ever met. When I pay good money for a product, I should be able to extract it from its package without undue hardship. I should not have to hunt for a tool in my house to open the package containing my new screwdriver. I should not have to look for bandages to cover the cuts on my hands from attempting to open my new box of Band-Aids. I surely should not have to risk slitting a vein with a sharp object to get to my new pair of scissors. Even the most common product packages sometimes send me into a tantrum. I have practically crushed an entire bag of potato chips just trying to open the freekin’ thing. The same goes for the semi-clear bag inside the cereal box, that must be sealed with glue used on the exterior of satellites. 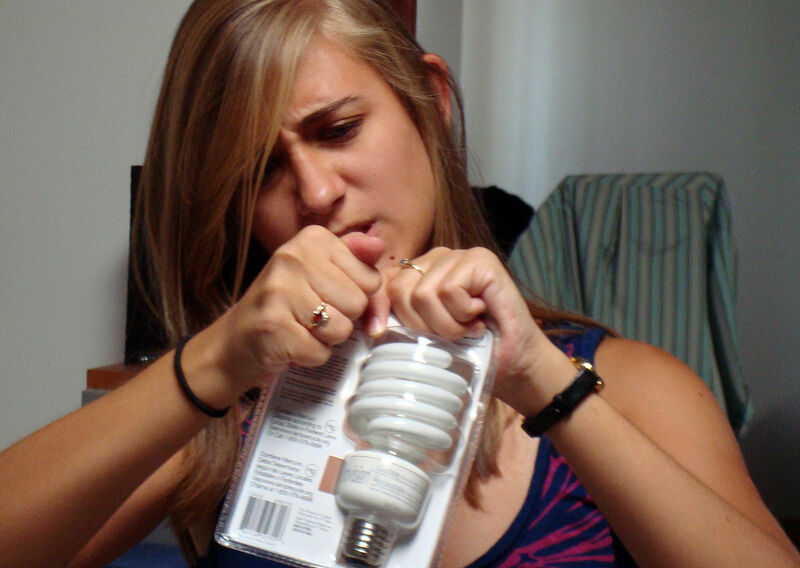 And who hasn’t wrestled with the package containing those incredibly energy-efficient compact fluorescent light bulbs, like the poor woman in the photo? How much energy do we lose just trying to get the damned thing out of the impregnable plastic? I have come very close to throwing away a brand, spanking new CD rather than be forced to find a knife to slit the micro-thin, impenetrable covering that was apparently sealed onto the jewel case by magical forces beyond common human understanding. And so, I find myself at the point in my life when I must ask the question that, sooner or later, all of us who reach the middle years will ask: why does it have to be so difficult? My younger son and I went out on the Hobie kayaks for the first time this season. We explored a lake in northeast Georgia that we’ve never visited before: Yonah Lake. We accessed the lake at Georgia Power Company’s campground, Tugaloo Park. 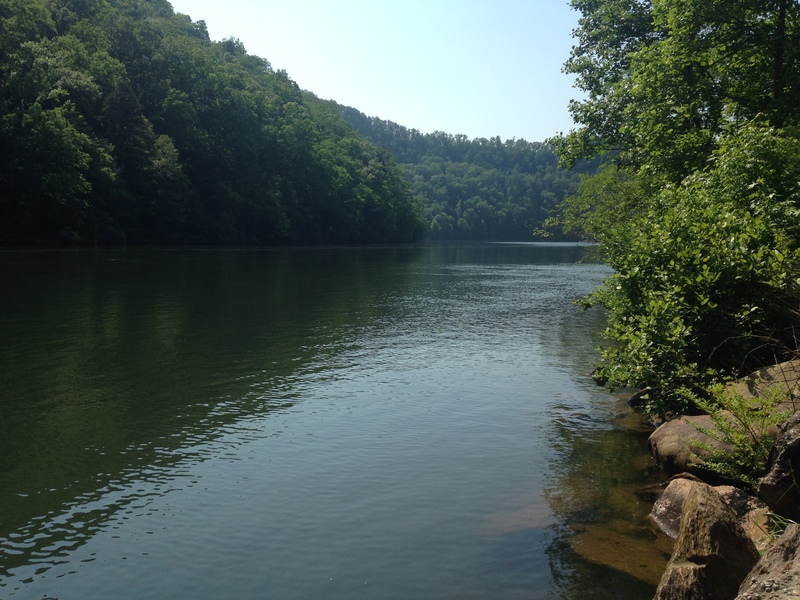 The lake is more like a very wide river winding its way between the hills near Tallulah Gorge. 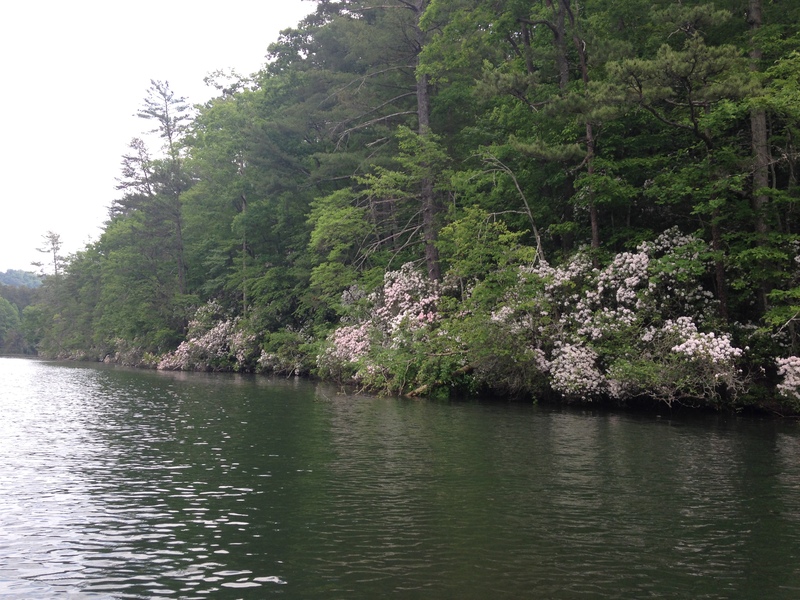 The mountain laurel around the shoreline is still in bloom and quite beautiful. 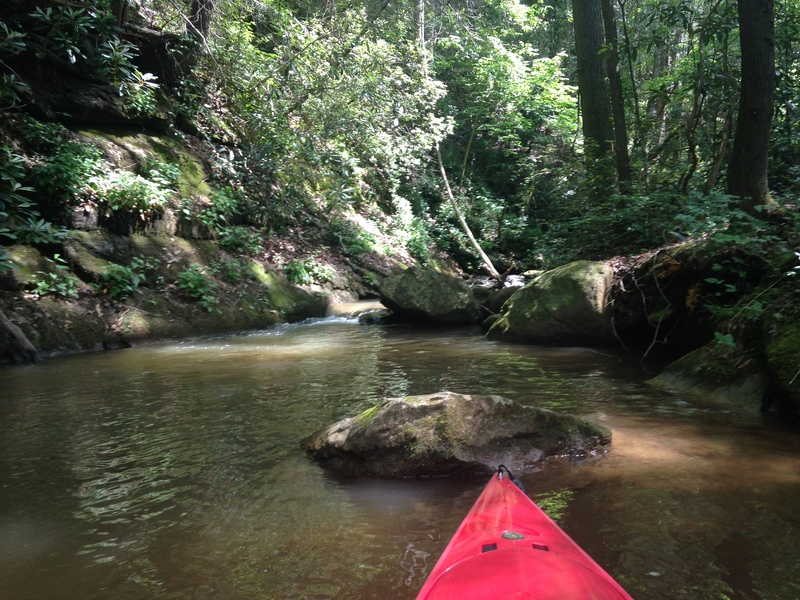 There is at least one brook that feeds into the lake in a great little shady cove that we could reach with our yaks. We also saw a guy skiing on a device that looked like a ski on top of an underwater blade. He was obviously training, performing some pretty impressive flips on the wakes. We will definitely come back to this spot again, perhaps to fish. This metal sculpture is on a hillside behind one of the new casinos in northern Oklahoma, just south of Arkansas City, Kansas. 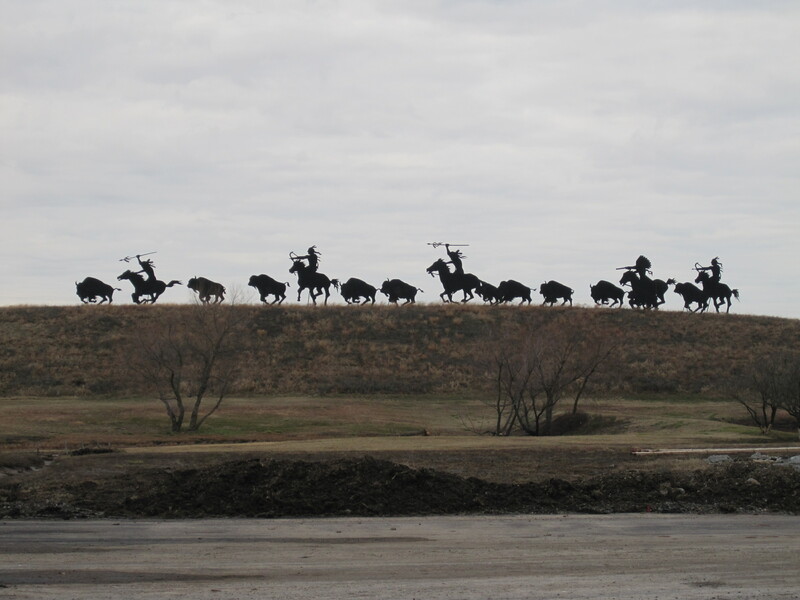 The Otoe-Missouria Tribe was encountered by Lewis & Clark on their epic expedition of 1804, when the inhabitants were still living in their Nebraska tribal home. So the story goes, the tribe was on a buffalo hunt, making Lewis & Clark wait on them to return to their village. There are statues in front of the casino commemorating that “First Council” meeting. The metal outdoor artwork obviously recalls the hunt. I find the sculpture particularly striking because it produces a silhouette effect regardless of the outdoor lighting. On an overcast day, like the one when I took this photo, the effect is quite pronounced. The individual pieces are large, and in a photograph, you can almost be convinced that they are real. I gasped when I first saw it and wondered why it was visible only from the back parking lot of the casino. I think it is magnificent. I hope that this fine display of art is not offensive to Native Americans, especially those in this particular area near the northern border of Oklahoma. I hope it is considered a tribute to a culture and way of life now buried deeply in our country’s past, with all its beauty and its scars.